If you happen to go by any Godiva chocolate store around Valentines day, you will know what I am talking about. 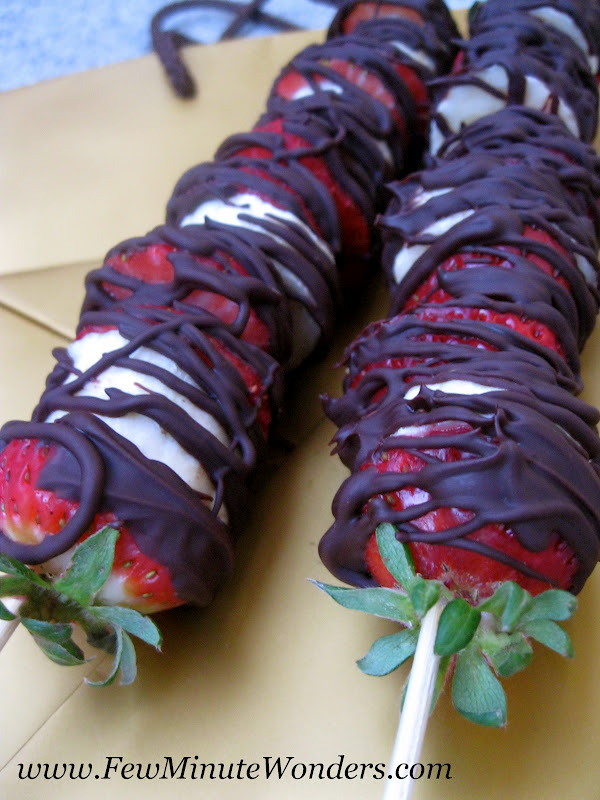 Strawberry and banana arranged on skewers and covered in drizzled chocolate: Absolutely elegant and divine.I would have not noticed them myself, if it was not for my pursuit in finding something special for my nieces 16th birthday. I had a cute box of chocolate in my hand but my eyes kept wandering towards the strawberry banana skewers near the checkout counter. The high school girl behind the counter was waiting for me to make my decision with a knowing smile. She said "I would go with the skewers" when I told her it was for a sweet sixteen gift. So, I chose the skewer. My daughter thought it was the coolest thing that she saw and when I went back to the store, they told me they don't have them anymore. I think some of these things are seasonal and so I decided to make them for her. 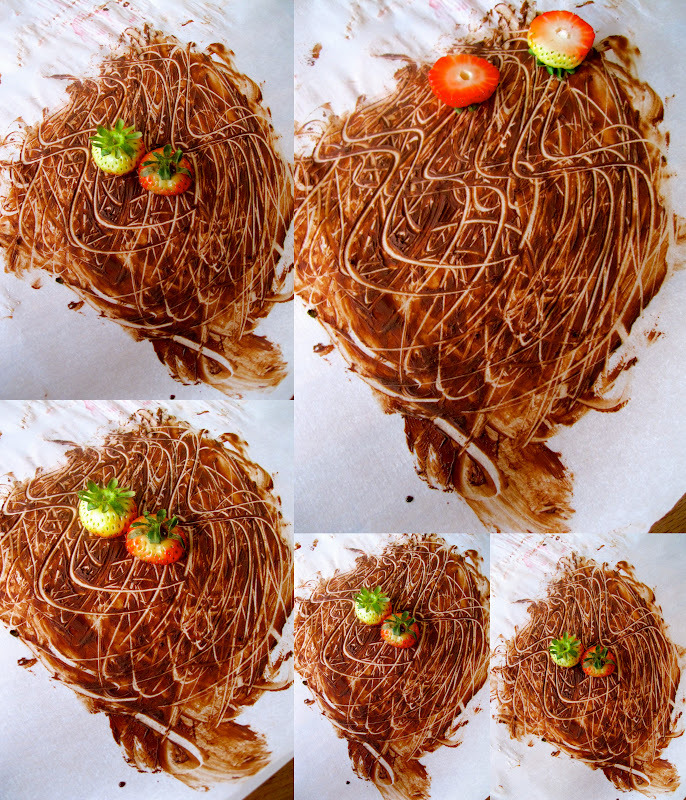 This was the first time I had a tough time making something because, my daughter and I ate most of the fruit and chocolate before it went on the skewer. Super easy to make and a lot of fun for both adults and kids. A perfect think to place on your dessert table and allow people to make their own skewers. 1. 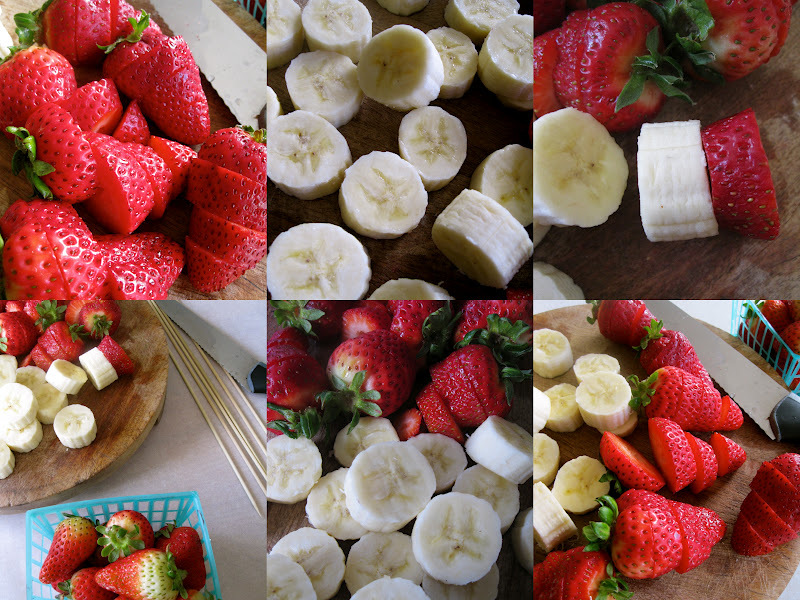 Clean and cut the banana and strawberries breath wise into 1/4 - 1/2 inch disc. 4. Start arranging the fruit in the skewer. 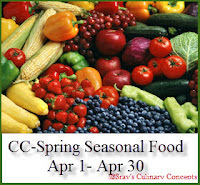 Always start with the strawberry with its stock and leaves. Then add bananas and strawberry as per your wish. I added 2 strawberry slices initially and then added a banana strawberry slices alternatively. 5. Roll out some parchment paper on your work surface and place 2 bowls of equal height about 9 inches apart. This helps to hold the skewers. 7. Using the squeeze bottle as swiftly as you can drizzle the chocolate going from bottom to top all over the skewers. Turn the skewer over and do the same on the other side. 8. Transfer the bowls to the fridge and place the skewers there and allow for them to set. It takes about 20 minutes. 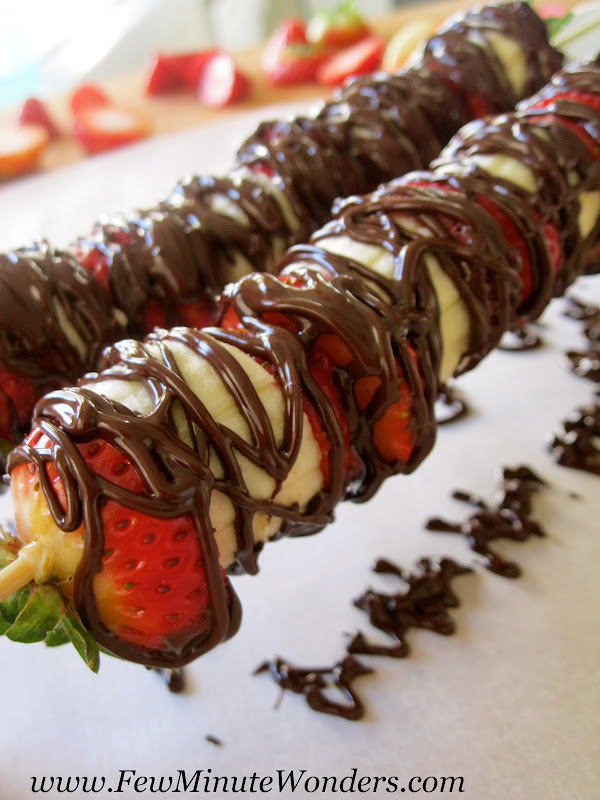 Again it all depends on the amount of chocolate drizzled. 9. 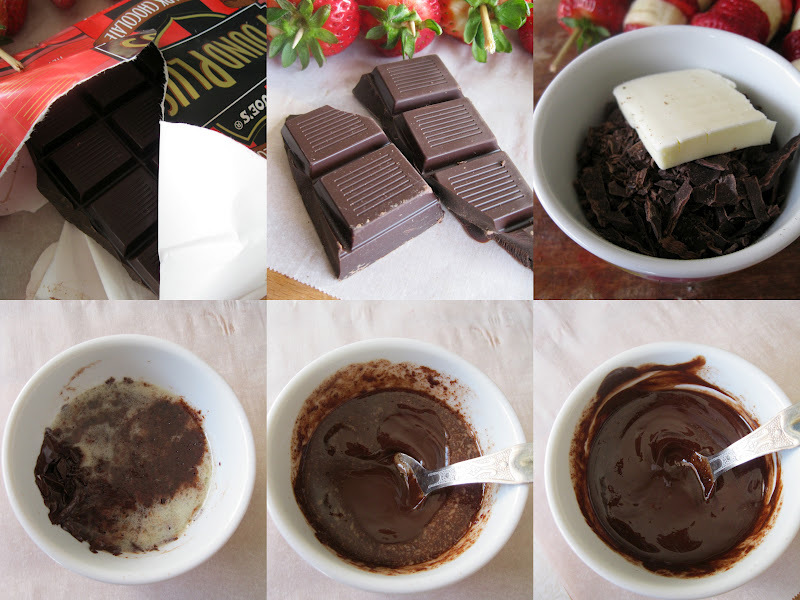 You will have a lot of chocolate drippings on the parchment paper. Ask you little ones to make beautiful chocolate faces like mine did. She called her master piece "The Chocolate Faces. 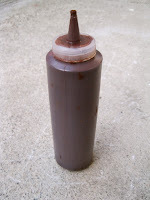 For those of you who think its wasting chocolate, allow the painting to dry and using the knife scrape out the chocolate and pop it into your mouth. Now your daughter must think you are the coolest mom! Nicely made. She will after she gets the whole skewer for snack after school. Has checked this morning to see if hers was in the fridge. 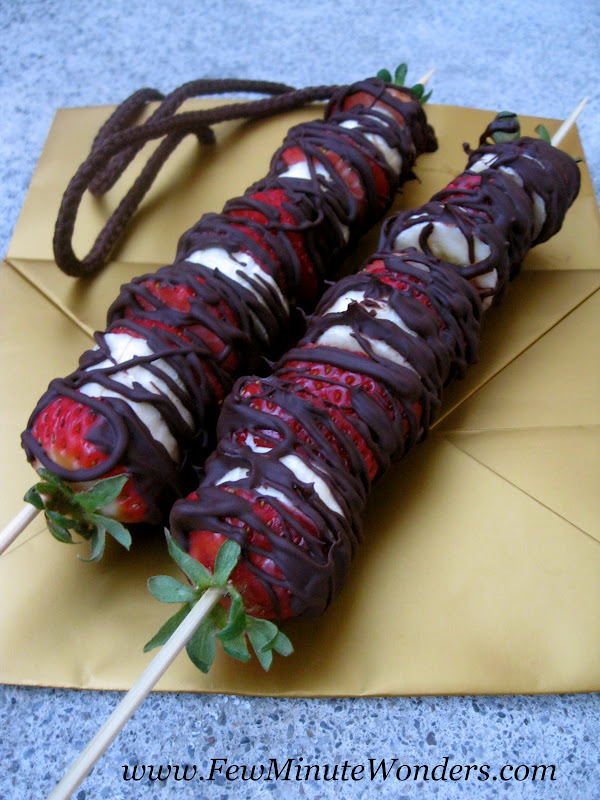 Omg, fantabulous skewers..cant take my eyes from ur clicks..feel like making some at home.. Awesome and tempting and I like the chocolate faces too..
Looks very pretty and tempting! I have lots of banana at home, maybe I will put it to use. Cool thing to do with kids,yummy treats,seems like you both had lots of fun. 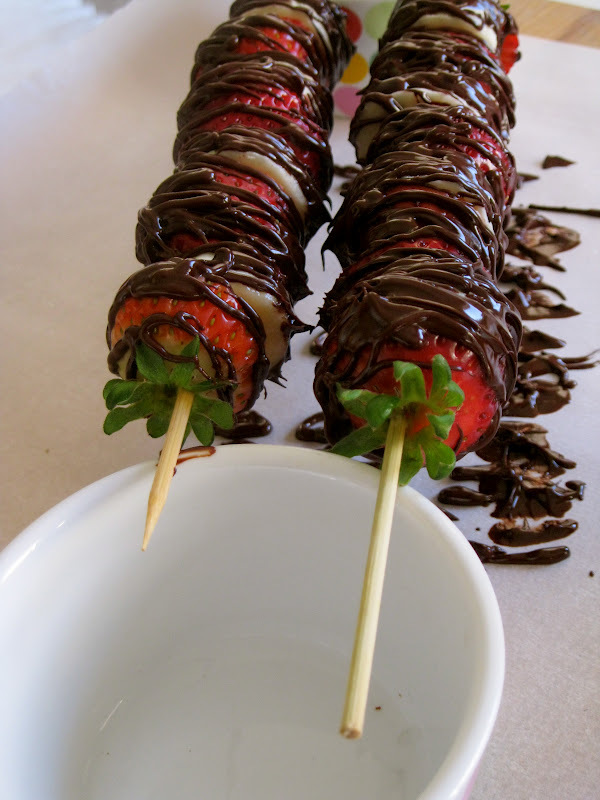 I love chocolate dipped strawberries and are a regular at my place. In fact I make them also as snack for my daughter when she gets back home from school. I would never have thought of making these.These look incredible! I love the idea. Does the banana turn brown though? I would love to try these out. Thank you Asmita, No the banana does not get brown at fast. I think you need to pick a firm banana. Please do try and your daughter will have a lot of fun making it with you.